Music therapy, which is led by a credentialed professional who has completed an approved music therapy program, is the clinical and evidence-based use of music interventions to accomplish individualized goals, according to the American Music Therapy Association. Music therapy is different from performance in that group and individual sessions are tailored to that group or individual’s needs. 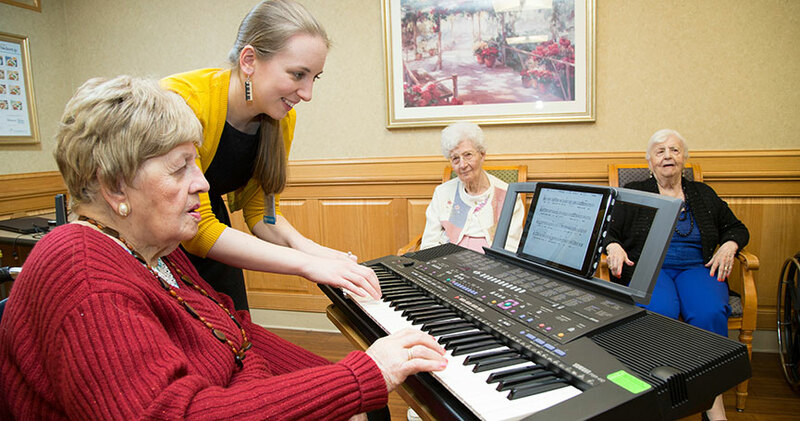 The overarching goal of music therapy for older adults is to improve quality of life and music therapists utilize music-based interventions such as group singing, instrumental improvisations, music- prompted reminiscence and songwriting to reach these goals. Hartford HealthCare Senior Services communities all offer music and performances as opportunities for socialization and entertainment. Several communities have Glee Clubs and choral groups – involving residents and staff – that rehearse and perform regularly. Jerome Home also provides therapeutic music enrichment visits under the direction of recreation directors. Jefferson House is among the few skilled nursing facilities in the state that has a full-time board-certified music therapist on staff.